Zezolla was a very happy girl. It had been almost a year since her poor mother had died, and she still thought of her often, but apart from that, Zezolla wanted for nothing. Her father, too, was very sad to have lost his beloved wife, but Zezolla was so much like her mother that he consoled himself with his love for the little child. But, happy as they both were, they would always miss Zezolla’s mother. There was, among the staff of servants in their home, a handmaiden who Zezolla favored above all others. She treated Zezolla with great love and affection, almost as a real mother would. And when they were together, she didn’t miss her mother as much. “I wish you could be my mother,” she said one day. Zezolla said she would, and after asking a few times, her father agreed and married the handmaiden. The wedding was beautiful; a joyous occasion in which the whole kingdom shared. And it was there that little Zezolla, more content than she had been since she lost her mother, staring out the window at the beautiful sunset, met the fairy. The fairy sighed. “Just remember what I have told you, child.” And without another word of warning, she flew away. Well, for a few days at least, Zezolla was right. Happiness did reign supreme in the home of the prince and his new princess (Did I forget to mention that Zezolla’s father was a prince? Sorry, must have slipped my mind) and Zezolla felt sure she would love her stepmother just as much as her birth mother…but then the handmaiden’s…sorry, the stepmother’s true nature revealed itself. All this time she had been pretending to be kind toward Zezolla in order to trick the child into asking her father if he would marry her. She didn’t really love Zezolla at all. In fact, she had six daughters of her own (whom she conveniently hadn’t mentioned to anybody until after the wedding) and though they, unlike Zezolla, were homely and nasty and spoiled, their mother doted on them endlessly. And to make matters worse, this wicked stepmother even turned Zezolla’s father against her! So now the Prince and Princess and their six daughters were very happy…but Zezolla was ignored. Treated like dirt. Forced to wear rags and old hand-me-downs while her stepsisters wore silk and satin. Forced to clean and cook and keep house while her sisters lazed about in the lap of luxury. Forced out of her comfy bed and her cozy bedroom and made to sleep on a cot in a closet. Poor Zezolla had no one left…until she remembered the fairy! They asked for pretty new dresses, dolls, jewelry, expensive tokens and treasures. Finally, almost as more of a joke than anything, he asked the same question of his own flesh-and-blood daughter, Zezolla. The Prince said, sort of carelessly, that he promised and went on his way. He completed his business in Sardinia, bought the expensive junk his stepdaughters wanted and—as we all knew he would—completely forgot about Zezolla’s request. He boarded the ship bound for home, but when it was time to cast off and take to the sea…the ship didn’t move. The ocean currents should have carried it out to sea, but it didn’t move. They unfurled the sails but, though the wind was with them, they didn’t move. Heck, they didn’t even bob up and down in the water like other ships did. That night, the captain of the ship slept, trying to figure out why they weren’t moving, when a fairy came to him in a dream. “Well, heck by the hatful!” said the captain. And just then, the grove sprang to life and fairies appeared all around him. They were just like the one Zezolla had seen: Tiny, beautiful, colorful and they actually kind of put him in a good mood just from being around them. The fairies gave the Prince three gifts: A silver spade, a golden pail and a single peach pit. They explained to the Prince that she must use the spade to plant the peach pit and water it with the golden pail. The Prince took these home and, after giving the fancy, expensive gifts to his stepdaughters, gave the pail, spade and peach pit to Zezolla, telling her the same thing the fairies had told him. Excited by the gifts, Zezolla immediately went out into the garden and dug a hole with the silver spade. She dropped the peach pit in, covered it with earth and filled the golden pail to water the plant. When she awoke the next morning, the peach pit had grown into a beautiful peach tree! With peaches and everything! Anyway, after his trip to Sardinia, the Prince went back to his old self, neglecting Zezolla in favor of his six wicked stepdaughters. Possibly if the family had paid more attention to Zezolla, they would have noticed the peach tree springing up literally overnight. They also would have noticed Zezolla herself stealing away to sit in its shade as often as she could. Somehow it made her feel…loved. The way she had felt those first few days before her stepmother stopped pretending. The way she had felt before her mother died. Sitting under that tree was the closest thing to a hug poor Zezolla had received in years. Then came the King’s Annual Festival. For three consecutive nights, there would be fantastic feasts at the palace and the whole kingdom was invited! Obviously, that included Zezolla. Even more obviously, her stepsisters were not about to let her go. She had nothing nice to wear, her hair was a mess and did she even own a pair of shoes? On the first night of the festival, Zezolla stayed behind and waved to her stepfamily as they rode away to the king’s feast. Once they were out of sight, Zezolla ran outside and hurled herself under her peach tree and cried and cried and cried. Her tears landed in the soil around the tree, seeped through to the roots of the tree and as soon as that tiny molecule of moisture touched the tree itself, something magical happened. Several peach blossoms opened to reveal, not peaches, but fairies. They flew all around Zezolla and raised her spirits the way they had done for her father back in Sardinia. “We tried to warn you that the wedding of your father to that horrible woman would bring you only misfortune,” said the fairies. “Oh, I guess you did. Okay, here we go!” The fairies flew all around her. They were fixing up her hair, cleaning her skin, doing her nails and turning her ragged clothes into a beautiful gown. Meanwhile, several fairies had taken a large peach from the tree and were turning it into a coach. The fairies themselves took the form of the horses and soon Zezolla was off on her way to the King’s festival. Well, when this mysterious, but beautiful, stranger arrived at the feast she created quite a stir. All heads turned wondering who she was…okay, the women wondered who she was. The men were wondering if she had a boyfriend or a husband. Even the Prince and his horrible stepfamily wondered who she was. It had been so long since any of them had seen Zezolla without dirt caked on her face from hard work or ragged clothes on that they didn’t recognize her. Then the King saw her. And he fell instantly in love with her beauty. He ignored his hosting duties all that night and spent all of his time with Zezolla. And the more time he spent with her the more in love with her he fell. Everything was going very well until Zezolla saw her family leaving the party. She knew she had to get home and changed out of these fancy clothes before they got home, or else they would want the magic of the peach tree all to themselves. She apologized to the king and ran to her coach. Zezolla smiled, “I floated to your majesty in a golden pail.” With these enigmatic words she fled, beat the others home, asked the peach tree to change her back and was inside, pretending to sleep on her cot when the family arrived. All that next day, the mysterious maiden was all anyone could talk about. Who was she? Where was she from? Would she be back the following night? Zezolla did her best to ignore all of these questions, but had the family paid her more attention, they might have seen her accidentally smile once or twice. The third night of the festival was the grandest of all. And, once again, Zezolla was the center of attention. The King, however, was determined that he would not lose her this time. He had his guards posted at every exit and they were given strict orders not to let her leave. So when the time came to run home, he let her go. Knowing that his guards would soon have her. And, indeed, when she was only a few steps away from the coach, she was set upon by the guards, who ordered her to stop. But, foreseeing just this kind of contingency, Zezolla had prepared herself. She had asked for something extra from the peach tree tonight, and as the guards advanced on her she took them from her pocket and scattered them all over the stairs. The guards knew these were valuable and not to be thrown away so they began to pick them up, giving Zezolla plenty of time to get into her coach. And as she pulled away, she called back to the guards, “Tell His Majesty that my love for him grows like a peach tree!” and, for the third time in as many days, she made it home just in time to get changed back into her old rags by the peach tree. But this time, she noticed that she was missing something. In the commotion caused when she dropped the precious stones, her left slipper had come off. She took the other one and hid it under her cot where it would always be there to remind her of this wonderful adventure…which she thought was behind her forever. The festival was over. The mysterious maiden was gone. The king was despondent. Until his guards showed him the shoe. It was the most amazing shoe the king had ever seen. It seemed to be woven of pure gold. Sturdy as leather but soft as silk. And intricate designs had been embroidered into it. Along the left side, water flowed from a golden pail. Along the right, a silver spade dug through the earth. And on the toe, a peach tree with shiny fruit and fairies all around. The King smiled. He knew he could find her again! The next day, there was a knock on the front door. Zezolla, of course, answered it, and was surprised to see the King himself standing there. She recognized him, of course, from the party, but he didn’t know her because of how different she looked…still, she thought there was a glimmer of recognition when he saw her…but that may have been her imagination. He had assumed (as who wouldn’t) that Zezolla was a servant. Still, she showed the King and his attendants in. One of the attendants, she noticed was holding a pillow on which rested an object hidden under a fine cloth. She had a hunch she knew what it was. Soon the entire family was assembled in the sitting room with the King. The King went down the line of Zezolla’s stepsisters, but of course none of them could describe the shoe. They had seen them, and admired them, along with the rest of the partygoers, but none had seen them close enough to be able to say for certain what was embroidered on them. None, that is, except the very youngest sister, who had been trying to remember any detail she could while her sisters were being questioned. All heads turned. Zezolla had been nonchalantly dusting the furniture during this entire interview, without saying a word or even looking up from her work until now. She still had not lifted her head and had made the comment conversationally as if her stepsister had misquoted a book or something. “Just that it’s not an apple tree. They’re peaches. And,” she carried on talking even though she had turned and gone into the next room, “on one side there’s a golden pail pouring out water and on the other side there’s a silver spade digging the soil. In fact, it looks…kind of like this.” She had returned from her cupboard with the other shoe, which she held up for all to see. The King was flabbergasted. Without really knowing why, Tomas took the cloth off the shoe on the pillow in his hand to prove to the world that they were a matched pair. And, of course, they fit Zezolla’s feet perfectly. You may be wondering whatever happened to the prince and his wife and her six horrible children? Well, I actually have no idea. Because after marrying the king, Zezolla never saw any of them again as long as she lived. Though I think, privately, in her own heart, she forgave them their cruelty. All I know for sure is that Queen Zezolla lived happily ever after. This is just one of the many stories throughout history and from all over the world which eventually became the story of Cinderella which we all know today. 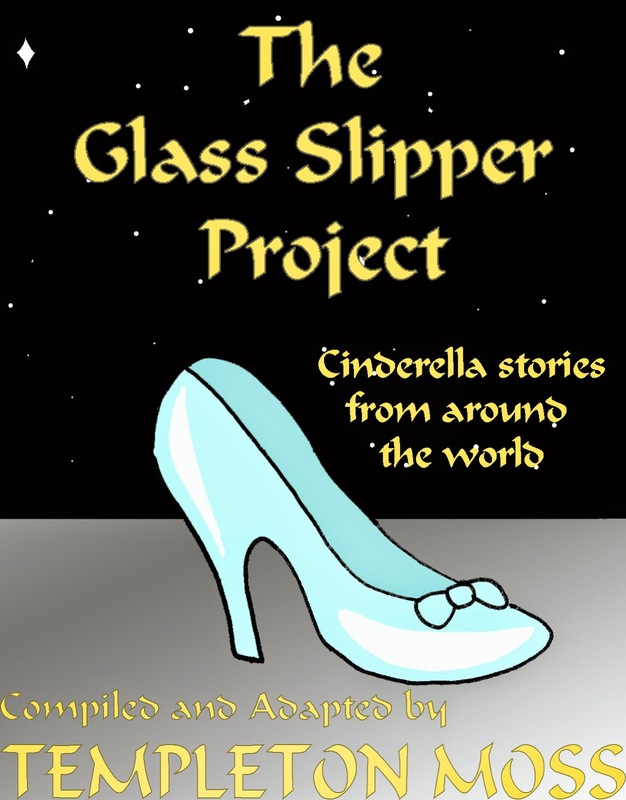 I have collected and adapted several of them in my book The Glass Slipper Project. Buy it today from the Amazon Kindle Store and learn a little something about the evolution of fairy tales whilst (and at the same time) enjoying some happy endings. For those of you who don't know me, my name is Warren J. Morton. I was orphaned at an early age and spent most of my early childhood in foster homes. I look back on those years as the worst of my life. That isn’t to say anything against the foster care system. I was always well cared for, had plenty to eat, always had the basic necessities. No, the reason I was so miserable back then was because I was lonely. There were usually lots of kids around, but I was very nervous around people and, therefore, had a hard time making friends. The lady who ran the place was Mrs. Holloway and she was very nice when she first met me. She showed me around the activity room, the kitchen and what she called the “visiting room,” where kids could sit down and talk with prospective parents. She also introduced me to the other kids. I think I may have managed to say “hi” to a few of them, but I was scared and don’t remember. Then she took me to Room B, my room, which she said I’d have to share with another kid. That made me even more scared. I was surprised that my roommate was a girl, since I was expecting to share with another boy. When we came in, she was sitting on her bed with her nose buried in a big book called The Sign Of The Four. I could see that she was wearing a sweater that was at least a size too big, old blue jeans, and a pair of very, very worn tennis shoes which may, at one time, have been pink. The girl, Shelly, looked up from her book and eyed me carefully. I saw that she was my age, with glasses and large green eyes, with which she was carefully scrutinizing me. I started to unpack my things. I was a little embarrassed, because I didn’t have very much to unpack. Just a few clothes and the only toy I owned: A doctor’s kit. I didn’t even remember where I got it from, but, for whatever reason, I always had it with me. Most of the kids thought it was weird that that’s the only toy I had, but Shelly looked at it with wide eyes. From then on, Shelly and I were practically inseparable. She showed me around the neighborhood, told me everything I needed to know about the other kids (and quite a few things I didn’t need to know and which I had no idea how she had figured them out), and she showed me her special Sherlock hat, which she told me was really called a “deerstalker” and which Arthur Conan Doyle only made mention of briefly on one occasion, but most people associate it with Sherlock because of an illustration by Sidney Paget…Again, I didn’t know what any of that meant, but it was really exciting hearing her talk about it. That night, before bed, she even read to me from one of her Sherlock books. I say she read it to me, but what she was doing could more accurately be described as “translating.” Shelly was way more advanced than I was, but she had no problem, for lack of a better term, “dumbing down” the parts I didn’t understand. Then came that fateful evening, about four days after we had first met. Shelly and I were playing Connect Four in our room (she was killing me!) when we started to hear moaning in the next room. Shelly quickly put on her Sherlock hat and shouted, “C’mon, Warren! And bring your kit!” and ran out the door. I didn’t know why, but I took my doctor’s kit and followed her to the next room, where Scarlet and Sarah slept, and there was Scarlet on her bed, moaning and wailing and clutching her tummy in pain. Shelly told me to examine her and I took out my toy stethoscope and listened to her tummy. It was growling and grumbling like an angry bear. “Yes, thank you, Warren,” said Mrs. Holloway, coming in and scooping Scarlet up in her arms. “But if you don’t mind, I think I’ll take it from here.” She took Scarlet downstairs to give her something for her upset tummy. The kids started to go back to their own rooms, but Shelly grabbed me by the arm and led me back inside Scarlet’s now empty room. Sarah was going back downstairs to watch TV, so we had the room to ourselves. Shelly and I looked around and saw that Sarah had entered the room. It was her room, after all. Apparently, someone was already watching a TV show she didn’t want to see, so she had come back upstairs to read. “Hmmm,” said Shelly, and I could tell she was doing some very careful thinking. Just then, we heard more moaning, from down the hall this time and we ran to Rachel and Joey’s room where Joey was moaning and crying just like Scarlet had been doing. And a moment later, Mrs. Holloway had taken him downstairs to join Scarlet for some tummyache medicine. Once again, Shelly and I started looking for clues. I didn’t, but it didn’t matter because just at that moment, Rachel joined us. Three strangers met in the woods one day at sunset. They had each traveled a great distance alone and agreed to make camp together for the night and share their provisions among themselves. The first was Frawd, a Dwarf from the mountains who leaned heavily on a cane as he walked. The second was Amos, a Human hunter from the valley who wore a patch over his left eye. The third was Tyrone, a Dragon with a broken horn and a weak and shriveled right arm. “Perhaps our friend the dragon could oblige us with a fire,” suggested Amos. “How does a dragon lose his fire?” Amos asked, preparing to light a fire the old-fashioned way. Both the dragon and the dwarf cringed slightly at Amos’ story. Eye stuff is always the worst, isn’t it? “The thought crossed my mind,” said Frawd. It made perfect sense that these three downtrodden souls would all be making their way toward the legendary Falls of Flicken: an immense waterfall to the north which was said to have healing powers to anyone who walked beneath its waters. No matter how serious or old the injury or malady, one trip through the curtain of those falls was said to cure anything, even if nothing else in the world could. Except death. Cuz, ya know…obviously, right? So the three strangers-turned-friends decided that very night to travel the rest of the way together and help each other along whenever possible. As our party traveled north together, all was going well. Then, all of a sudden, Amos held out a hand, signaling for the others to stop. “Did you hear that?” he whispered. “I don’t hear anything,” said Frawd. “Do you think you could manage?” asked Frawd. “Just long enough to get out of the woods? Yes.” And he wrapped an arm around the man who wrapped an arm around the dwarf and the dragon took off into the sky. Sure enough, the hunter Amos had heard (and, apparently, smelled) fired an arrow at Tyrone after he broke above the tree line. Luckily, it missed, and Tyrone was able to reach the far side of the forest and safety. “How do you feel?” asked Amos. For a moment, they all sat in silent thought. When Tyrone was feeling better they continued on their journey. And it wasn’t long before they arrived at the legendary Falls of Flicken! That famed waterfall of magical healing water! That glorious…spectacular…tiny little…it was a spring. That’s all it was. Just a little trickle of water passing over some rocks. “I guess some of the stories were exaggerated,” said Tyrone. “Well…are they at least magical?” asked Amos. To find out, Frawd cupped some of the water in his hands (which took a very long time, as you can imagine) and splashed it on Tyrone’s bad arm. They all three stared at it. Nothing happened. It was clear that the Falls of Flicken did not have healing powers. They had come all this way for nothing. When Tyrone got to his home, everyone was still laughing at how spectacularly he had been beaten and teased him about his lack of fire. Except one very pretty girl dragon who didn’t like guys who were always fighting and preferred the sensitive, gentle type who looked before he leaped. She felt bad for what Tyrone had been through and became a very good friend to him…and a very good wife! When Frawd arrived home, he was asked to take over the position of Chief Dwarf. His years of experience and wisdom, not to mention the bravery he showed in trying to mine that abandoned tunnel, made him perfect for the job! When Amos got back to his village, the huntress who had shot him, thereby indirectly causing his injury, felt terrible for what she had done. And she admitted that while she was a good shot and had a keen eye, she needed training on some of the subtler aspects of hunting. Listening carefully, recognizing smells, things like that. Amos agreed to teach her and, about a year later, to marry her! So, you see, even though all three of our friends thought their lives were over, all that their injuries really meant was that they had a chance to start new lives. Lives that were very long and very happy…all thanks to the Falls of Flicken! Freddy Flunkerer wrote some extraordinary (and unusual) fairy tales back in his native country of Jolsonburg. 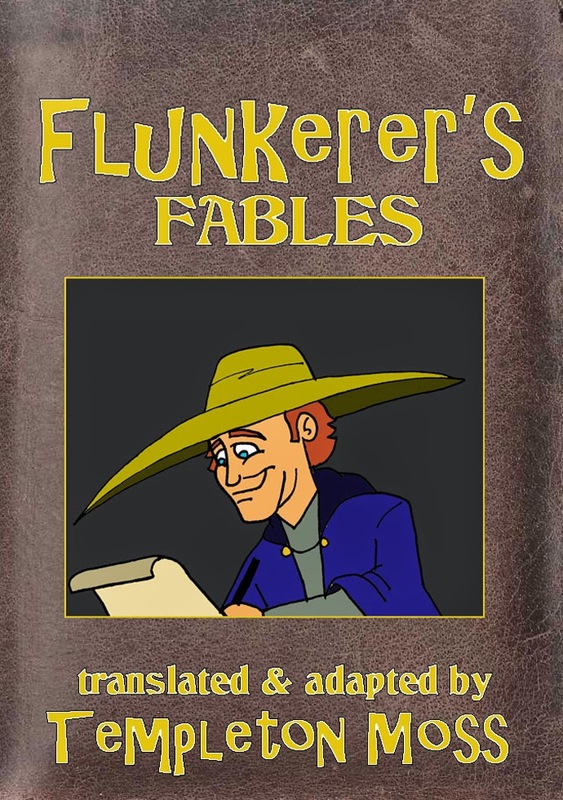 Read all about the man and his stories in Flunkerer's Fables, for the Amazon Kindle or whatever mobile device you prefer!